A working pool filter is one of the most important parts of keeping your pool clean and inviting to swim in. Just like the human liver, it will filter dirt and debris, keeping it from damaging the water system. If your pool filter is not working correctly, it leads to larger problems that can result in damage to your pool. Pool filtration systems come in three main categories: Filter cartridge, sand, and DE (diatomaceous earth powder). The first indication of a filter that may need to be replaced or cleaned is a high pressure reading on the pressure gauge (usually above 30 psi). Excessive pressure can cause cracking in the lateral (bottom of the filter standpipe), resulting in sand leaking back into the pool. It can also cause the filter tank itself to crack. If DE is leaking back into the pool, it's usually the grids that are worn and have tears in them. Too much DE material in the filter can also cause it to backflow into the pool. Low pressure readings can also indicate a filtration problem, resulting in poor water circulation. You'll see low pressure when water is not allowed to flow into the filter, indicating some type of obstruction. Check the strainer basket as well as the impeller. If you see a clog in one or both of these (usually leaves), make sure to clean out this debris to increase the flow of water. You can replace filter cartridges or grids for DE filters, but just make sure you are replacing the right part, as there are many different sizes. Usually the filter tank is marked with the correct size to use. But if you don't see this info on the tank, then take accurate measurements of the cartridge, don't guess the dimensions by looking at it! If replacing sand, make sure that you use the correct level of sand in the filter tank, and the sand type. There are a few different types of sand grades, so make sure you are using the correct one recommended by the filter manufacturer. 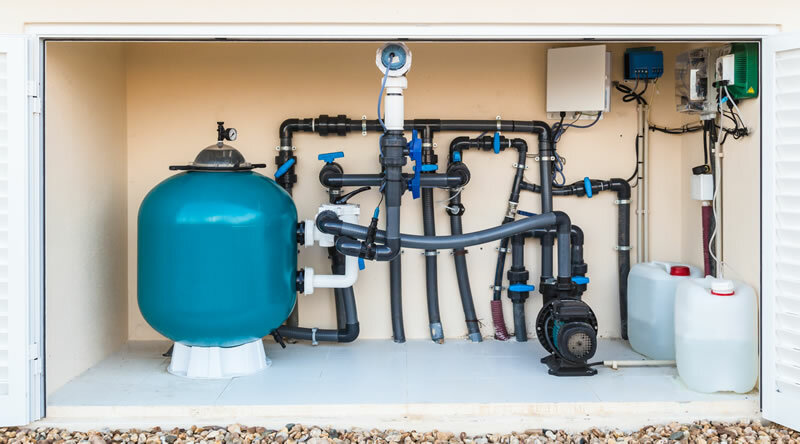 If you don't want to attempt any of the pool filter troubleshooting or replacement procedures described above, our trained professionals will do this for you. This is what we do, so you can trust that your pool filter will be running like new when we leave your service call.